We are the leading and prominent Manufacturer, Exporter and Distributor of Fein Pipe Jigsaws MF 14-180. 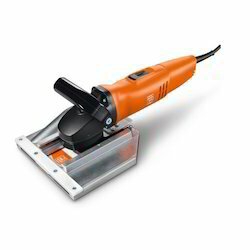 We are the leading supplier of Fein Tiles Plaster Cutter MF 14-180 made available to our clients at competitive prices. 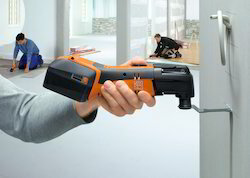 The FEIN MULTIMASTER system is perfectly matched to the everyday requirements and needs of its users – with an extensive range of accessories for all professional applications in interior fittings, renovation and repairs. You can choose between four different FEIN MULTIMASTER Sets, which are graded according to their range of accessories and capacity – from a basic programme up to a complete set including dust extraction.Renovate bathrooms and kitchens cost-effectively and at speed. 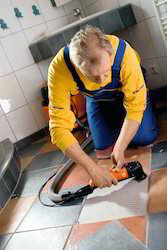 The FEIN MULTIMASTER can be used to replace individual damaged tiles without damaging the surrounding ones. With the diamond saw blades or the carbide segment saw blades; the FEIN MULTIMASTER Cuts tile joints with extreme precision and produce minimal dust levels. Old tile adhesive can then be removed with ease using the carbide rasp or the stopper knife blade.Nothing can replace the MULTIMASTER for interior work. 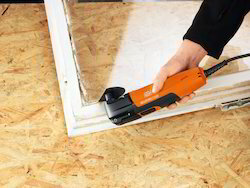 No matter whether you want to restore your attic, install a partition or hide the cables of your stereo system behind the wall, the FEIN MULTIMASTER is the perfect tool for all repair and installation work. Even in tight spaces, the FEIN MULTIMASTER saws with precision in recesses and corners and removes a great deal of material when sanding. It allows you to work at speed and with little effort. Ideal for dismantling installations that are no longer required. 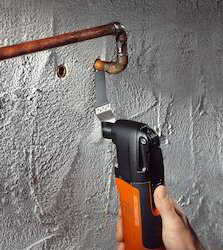 The E-CUT universal saw blades can be used to cut off pipes flush to the wall for subsequent filling. 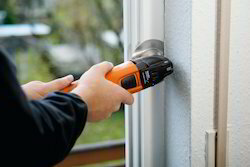 Powerful motor, high-quality materials, outstanding ergonomics – the FEIN SuperCut Construction is the most powerful system for interior and renovation applications. It’s fast, strong, versatile and, of course, durable. It allows you to work up to 350% faster, even in tough continuous use in heavy-duty sawing applications, which is hardly surprising, as the new FEIN Super Cut embodies more than 40 years of experience in developing durable oscillators for industry and manual trades. The FEIN SuperCut Construction is the unique oscillating power tool on the market and its performance is consistently focused on the needs of tough sawing and cutting work. FEIN has thereby developed an oscillating tool which permits work to progress at levels that can otherwise only be achieved with professional jigsaws and saber saws with numerous applications and materials. At the same time, this tool can be used for virtually any application, a feature only found in oscillating power tools. Even as a battery-powered tool, the FEIN SuperCut remains the most powerful oscillator with durable professional quality. The work progress and performance delivered are practically the same as the mains-powered tool. The modern lithium-ion technology keeps the weight low and prevents memory effects. As 2 batteries and a powerful charger are supplied, you can work without interruption even at high loads. 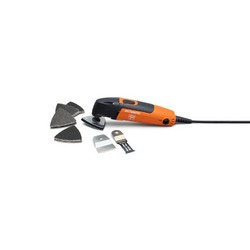 Whether you’re dealing with simple on-site installation or fitting furniture, flooring, doors, lightweight walls or stairs, your work is made considerably easier with the FEIN professional set for interior work with wood. The FEIN SuperCut Construction offers speed and convenience wherever circular saws, jigsaws, and saber saws are needed and where manual tools previously needed a great deal of manual effort. You therefore no longer need any free space behind the workpiece. 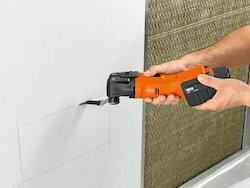 The FEIN SuperCut Construction can work at any angle and flush to all surfaces. Thanks to the HSS saw blade and the depth stop, you can also make long cuts in ready-laid parquet or laminate flooring with ease. You can even use it to easily and quickly make precise cuts by hand. The FEIN SuperCut Construction offers speed and convenience wherever circular saws, jigsaws, and saber saws are needed and where manual tools previously needed a great deal of manual effort. You therefore no longer need any free space behind the workpiece. 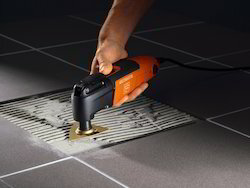 The FEIN SuperCut Construction can work at any angle and flush to all surfaces. Thanks to the HSS saw blade and the depth stop, you can also make long cuts in ready-laid parquet or laminate flooring with ease. You can even use it to easily and quickly make precise cuts by hand. 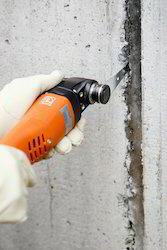 The FEIN SuperCut Construction is the unique oscillating power tool on the market and its performance is consistently focused on the needs of tough sawing and cutting work. FEIN has thereby developed an oscillating tool which permits work to progress at levels that can otherwise only be achieved with professional jigsaws and saber saws with numerous applications and materials. At the same time, this tool can be used for virtually any application, a feature only found in oscillating power tools. If tile joints need to be removed completely and renewed, the round diamond saw blade is the most cost-effective solution – both in terms of work progress and service life. 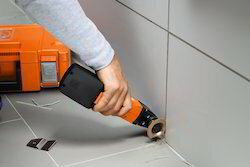 The FEIN MULTIMASTER system is perfectly matched to the everyday requirements and needs of its users – with an extensive range of accessories for all professional applications in interior fittings, renovation, and repairs. You can choose between four different FEIN MULTIMASTER Sets, which are graded according to their range of accessories and capacity – from a basic programme up to a complete set including dust extraction. The oscillating motion of the FEIN MULTIMASTER, which makes it a truly universal tool, is suited to countless applications that would otherwise require a great deal of effort and time. It’s extremely durable transmission and the oscillating motion ensure an outstanding working speed in all applications such as sawing, sanding, cutting, separating, scraping and polishing on virtually all materials. 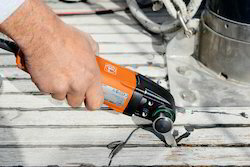 The FEIN MULTIMASTER offers considerably increased efficiency in boatbuilding and renovation. With a high cutting performance, the FEIN MULTIMASTER works perfectly with wood, fiberglass, carbon fiber-reinforced plastic and virtually all other relevant materials. There is, therefore, no need for manual work and improvised solutions. It’s just as easy to make subsequent installations in tight spaces as it is to satin-finish teak decks. 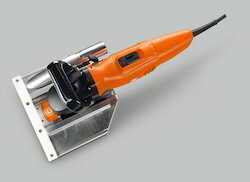 We are the leading and prominent Manufacturer and Supplier of Fein Construction Cutter MF 14-180. Renovate bathrooms and kitchens cost-effectively and at speed. 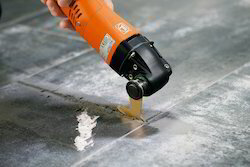 The FEIN MULTIMASTER can be used to replace individual damaged tiles without damaging the surrounding ones. With the diamond saw blades or the carbide segment saw blades; the FEIN MULTIMASTER Cuts tile joints with extreme precision and produce minimal dust levels. 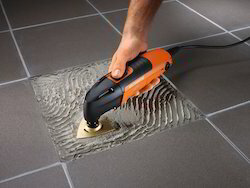 Old tile adhesive can then be removed with ease using the carbide rasp or the stopper knife blade. The segment saw blade is used to remove damaged tile joints in corners and on edges, as it enables precise working without overcutting. The segment saw blade is available in carbide or diamond quality. Diamond saw blades offer impressively longer service lives and are also suited to frost-proof joint materials containing epoxy resin used outdoors or to replacing joints. 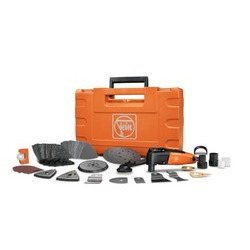 With three long-lasting, high-performance power tools and an optimum range of accessories, FEIN offers a practical system that professionals have relied on for decades. The system components, which have proved themselves in tough, everyday industrial use, cover all important applications. 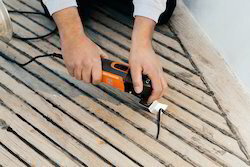 By opting for the FEIN Marine range, you can keep equipment and fi ttings state-of-the-art. Professional, cost-effective boat repairs and maintenance also signifi cantly reduce the loss in value of your vessel. The equipment and fi ttings on a yacht or boat need to be keptstate-of-the-art over long periods or adjusted to meet the owners’ changing requirements. And to do that you need tools that last just as long. The FEIN MULTIMASTER MARINE TOP is the universal system for all materials. It features a highly robust saw which is equally happy to tackle wood, fi breglass, carbon fi bre-reinforced plastic, plasticsor sheet metal. Combined with the right accessories, the resilient FEIN MULTIMASTER MARINE TOP saws completely plane to the surface,in any desired direction. It cuts into the material like a mortise chisel, requiring no free space behind the workpiece. Consequently,it works very cleanly with the minimum amount of dust. The FEIN MULTIMASTER MARINE TOP is equally fl exible when it comes to cuttinglength, handling distances from 10 mm to infinity – there are no limits! 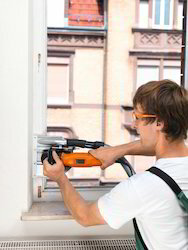 The FEIN MULTIMASTER system is perfectly matched to the everyday requirements and needs of its users – with an extensive range of accessories for all professional applications in interior fittings, renovation, and repairs. 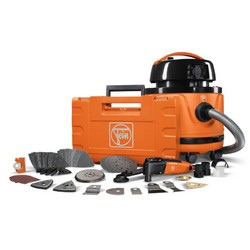 You can choose between four different FEIN MULTIMASTER Sets, which are graded according to their range of accessories and capacity – from a basic programme up to a complete set including dust extraction. 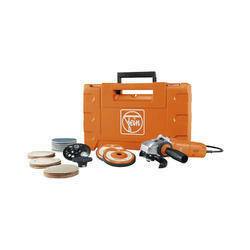 FEIN MULTIMASTER makes applications such as sanding medium-sized and large surfaces child’s play. It features outstanding sanding capacity, delivers perfect surface results and even allows you to sand near edges without kick-back – which means you don’t even have to use an additional random sander. Brittle putty can be removed with ease and without the risk of glass breakage using the HSS segment saw blade. Grout sealants age and need to be replaced at some point so as to not damage the building fabric. It’s a cumbersome and exhausting manual task. The professional set for grout renewal doesn’t only make this task easier and a great deal faster than doing it by hand, but it also requires considerably less energy. In the case of older properties, grout sealants containing PCB were also used as well as the largely safe acrylic or silicone-based grouts. The professional set for grout renewal includes a dust extraction device which is suited to the job and, when used in conjunction with an approved dust extractor and the specified protective measures, guarantees the best possible health protection. The professional set can quickly and safely remove all elastic sealants in both exterior and interior spaces. And you still only need one tool to remove old material and roughen joints before filling them in again. Carbide-tipped For coarse sanding of fillers, tile adhesives, concrete, stone, and wood. Suited to use with or without dust extraction. Due to our expertise and experience in the domain, we are able to provide high quality FEIN Multi Master Top Extra 25. These products are manufactured with the use of advanced technologies and quality graded raw material. The professionals working with us assure that these products are manufactured in line with the quality standards. With the help of our far-reaching distribution network, we have been able to deliver these products at clients' destination within the promised time frame. Looking for Construction Tools ?